A spacious 2 bed property in town with the added bonus of own car park space. Peaceful location, 3 minutes to shops, 5 minutes to beach, Castle and Harbour. This bright and spacious house has a warm and homely feel with the added bonus of your own car park space to the front of the house. You enter through to the side of the property into a large hallway. A sensor activated outside light automatically comes on at the side door. To the front of the house is the lounge with 2 sofa's and a log effect fire and flat screen TV. There is a second WC downstairs off the hall. The kitchen / dining area is to the back of the house leading to the veranda and sunny garden. There is a feature stairwell leading to the two double bedrooms, one with a king size bed and the other with a double and a single bed. Now featuring a brand new top of the range first floor bathroom with shower over roll top bath. The house has gas central heating and free Wi Fi. We are only 4 minutes walk away from the mainline station with direct links to London. 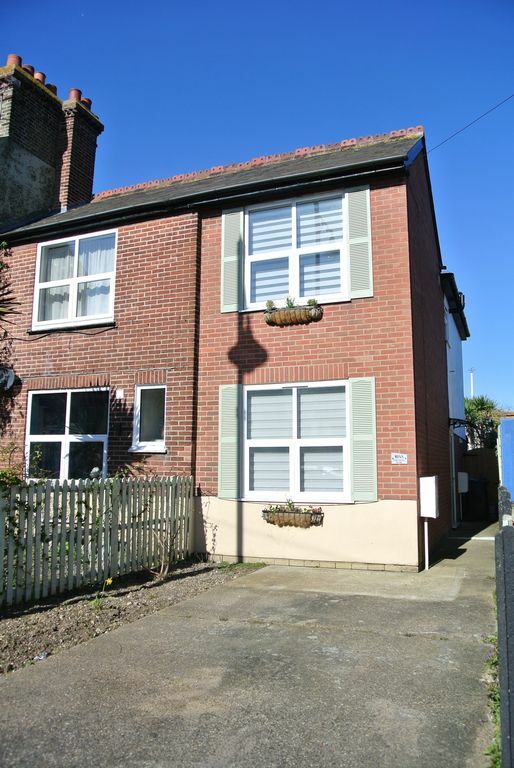 3 minutes to the shops, 8 minutes to the beach, harbour and castle. A central but peaceful location ideal to look around this charming Town. We loved the feel of this house the first time we saw it, from home to home. The location is ideal for driving or walking and the car park space on the front is one thing less to worry about. It is only 4 minutes walk away from the mainline station. We spend much of our time relaxing and enjoying the house and surrounding areas. There is so much to explore. Many well known restaurants in the area, you will often need to book in advance. Enjoy the cycle routes around the town and seafront, or walking if preferred. The local swimming baths are next to the harbour along with a family bowling alley. Whitstable Castle is between the harbour and Tankerton Slopes, a few minutes walk from the house. This is a lovely house with high ceilings and lots of natural light with large hall areas giving a spacious and relaxing feel. The garden has a veranda so you can enjoy the garden whatever the weather. The parking to the front is priceless in busy times. toilet, combination tub/shower, Newly fitted roll top bath with large shower head over bath. toilet, Downstairs WC. Hand basin. Brand new bathroom includes a Burlington roll top bath with Burlington shower and shower screen with access door for controlling shower on/off without getting wet. Gas Central Heating which provides hot water. Fresh Linen provided with stay. A wall mounted log effect electric fire in the lounge. Car park space at the front of the property. Fresh towels provided with stay. Please do not use these at the beach. There is a couple of beach towels in the oak chest at the top of the stairs. If used please leave out to clean when leaving. We have 2 sofas which can seat up to 5 people. Also a small chair for one person. New appliances with Cooker/Hob/Dish Washer/ Microwave/ Fridge/Freezer/ Washing Machine. An extendable table with 5 chairs. Crockery, cutlery, glassware, saucepans, wok, kettle and toaster. Highchair. The dining area is in the kitchen with an extendable table. Easily sits 5 adults. Flat screen televisions, one larger one in lounge and one in back bedroom. DAB Radio and I pod dock in kitchen. DVD player in the lounge. Various books on the bookshelf in the hall. On the upstairs landing some family games are in the oak chest. Some DVD's are on the bookcase in the hall. A sunny private back garden with plenty of seating area's. We have 2 ladies bikes and one gentleman's bike to use with access from the side gate. The veranda is from the kitchen door. An outside sofa for enjoying the afternoon sun or a bit of shade during the day. We have the bedrooms upstairs and no lift. Next to the harbour is the public swimming baths and gym. A 5 minute walk away. Own car park space plus a private garden with veranda. We are situated in the town with easy access to all the main routes out of town. The Whitstable mainline station is a 2 minute walk away. There are many ways to walk into town or cycle with stream walk a few meters away which is a cycle and walking route towards the harbour and town. House in good condition with modern fittings/ fixtures. Layout with upstairs bathroom and wide hallway a welcome change from Whitstable's 'fishermans cottages ' ie terraces. Great venue, well equipped, comfortable and meeting all our requirements and more. Whether relaxing in the house or garden just right for a seaside break. A short stroll takes you to the harbour and seafront. This is a lovely house, perfect for a family of four. Immaculately presented with the bonus of a parking space out front - rare in Whitstable. The house has everything you might need, including games, DVDs and beach towels. I spent a lot of time in the lovely back garden, reading books and drinking tea. It's about a 10 minute walk to the harbour or High Street, following alleyway routes which were fun to find. Highly recommended - we are looking forward to coming back. The house was very welcoming a home from home. Light and space with a lovely garden to relax in. Whitstable town has a lot to offer, many independent shops and local artists as well as a small theatre and the horsebridge café which also shows live music and films on a regular basis. If you like walking Reculver Towers Roman Forte and country park is just past Herne Bay.